With a convincing 7:3 victory over Katarzyna Wesolowska (POL), Jasmin Ouschan (AUT) has secured another title for her collection, the victory at the Dynamic Billard German Women Open tournament in the Stadthalle in Baunatal, Germany. The final match was dominated by Ouschan alone. Her break was good and only in the beginning of the final match, Wesolowska seemed to put up some resistance against Ouschan. The more the match went along, the clearer Ouschan‘s will to win was while Wesolowska‘s energy seemed to have lost her somewhere along the way. It seemed as if Wesolowska had lost all her power in the tough semi-final, where she had to face Diana Khodjaeva (BEL). Although being up 6:2 already, Wesolowska could not close the book on Khodjaeva. The Belgian struggled and pulled back rack after rack, partly because of Wesolowska‘s mistakes, partly because of her own strong play. At 6:6, two balls were remaining on the table and Khodjaeva provided a decent safety position for Wesolowska. 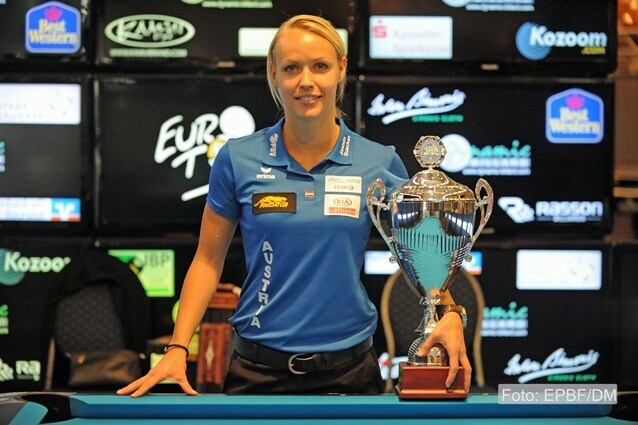 Katarzyna Wesolowska had to go for the 7-ball over one rail. She went for the shot, pocketed it and got perfect position for the 9-ball. That brought her into the final match. On the other side, Ouschan more or less destroyed a so far strong playing Nataliya Seroshtan (RUS) with a 7:2 result. So Jasmin Ouschan had more or less smooth sailing into the final match. Ouschan did not lose one match throughout the whole event. Most matches, she was dominant from start to the end. Whenever she had to struggle, it seemed that this was only in the first few racks of the respective match. Then, there appeared to be a point in time when Ouschan kind of „switched into overdrive mode” and simply ran away from her opponents.